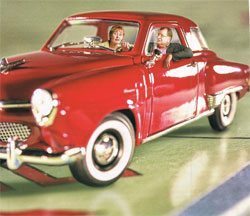 It was the winter of 1963 in South Bend, IN, when the last Studebaker automobile built in America rolled down the assembly line. The company, which had begun as horse-drawn wagon maker 111 years before and had survived two world wars and the stock market crash, was effectively wiped out. On the heels of the plant’s closure, Studebaker terminated its retirement plan for hourly workers. In his article The Most Glorious Story of Failure in Business: The Studebaker-Packard Corporation and the Origins of ERISA, 49 Buffalo Law Review 683 (2001), Professor James A. Wooten writes that “No single event is more closely associated with ERISA than the shutdown of the Studebaker plant in South Bend.” Wooten goes on to chronicle how the plight of the Studebaker employees emerged as a symbol of the need for pension reform and how the United Auto Workers union used the opportunity created by the shutdown to push the cause of pension reform onto the national legislative agenda. While symbolic, the predicament of the former Studebaker employees was by no means unique. Up until this time, employee benefit plans had not been regulated at the federal level, and a significant number of Americans reached their “golden years” only to find that their pension funds had been drained by theft, bankruptcy or fundamental mismanagement. Thus, it was on Sept. 2, 1974, that the Employee Retirement Income Security Act, 29 U.S.C. 1001 et. seq., ERISA, was signed into law by President Ford. As its name implies, ERISA was intended by Congress to protect employee pension and welfare plans by providing federal protections that would apply uniformly in all 50 states. Prior to its enactment, employees of the same company — even those participating in the same plan — may have had vastly different legal remedies if they lived in different states. ERISA’s uniform scheme. Hence, Congress gave ERISA a preemption clause that made it supersede all state laws relating to any employee benefit plan. 29 U.S.C. § 1144. See Ingersoll-Rand v. McClendon, 498 U.S. 133 (1990). 32 South Carolina ERISA preemption is comprehensive and, generally speaking, prevents insureds from seeking redress for the denial of their health or disability benefits under any state law — or state common law — cause of action. The insured’s sole remedies are those granted by ERISA. maintained by employers (or unions) to provide benefits for employees and their families. These include all plans that provide benefits for medical (including mental health), surgical and hospital care, disability, death, severance and unemployment insurance (above that required by state law). See 29 U.S.C. § 1003. In practice, almost all plans established or maintained by employers to provide benefits for employees and their families are “ERISA plans,” the most common exceptions being for employees of churches and governmental entities. Of course, those who purchase insurance as individuals and not through any employer plan are not considered part of an ERISA plan. Key players and terms in the ERISA “game” Pension Benefit Plan — any plan, fund or program established by an employer and/or union that provides a retirement income for employees or deferral of income for use after employment. Welfare Benefit Plan — any plan, fund or program established by an employer and/or union providing benefits including medical, sickness, accident, unemployment, vacation, disability, day care, scholarships, training programs and prepaid legal services. Plan Fiduciary — anyone who exercises discretionary authority over a plan’s management or assets. 29 U.S.C. § 1002(21). ERISA holds plan fiduciaries accountable for losses to the plan in the case of noncompliant management of the plan. Plan Sponsor — one who establishes or maintains an employee welfare benefit plan. Unless the plan states otherwise, the plan sponsor is the employer. Plan Administrator — usually, but not always, the person or entity that actually processes the claims, administers payments, etc; however, the plan may designate an administrator that does not actually perform these functions, and these functions may be outsourced to a “Third-Party Administrator” or “TPA” who performs the actual administrative functions. Depending on the circumstances, the plan administrator may or may not be a fiduciary as defined by 29 U.S.C. § 1002(21). Note also that, unless the plan specifically identifies an administrator, the employer will be considered the administrator. Summary Plan Description – the “SPD” is a summary of the plan in which the employee is a participant. The plan administrator is required under ERISA to provide the SPD to employees free of charge. The SPD is critically important because it outlines, in summary form, what the plan provides, how it operates, its dates of participation and the calculation of benefits. If a plan is later changed, the participant must be informed through a revised SPD or in a separate document, called a Summary of Material Modifications, which also must be provided free of charge. Let the games begin — fundamentals of handling an ERISA case Assume you meet with a client who tells you that his claim for long-term disability insurance — which he obtained through his employment — has been denied. Since this insurance is a “welfare benefit plan” as defined by ERISA, you determine that ERISA will be the focus of any litigation. So what to do now? Here is what not to do. Do not file a lawsuit before ensuring that the employee has exhausted all administrative remedies available. This means that the employee must take advantage of all rights to appeal an adverse decision as provided in the plan, within the time limits outlined in the plan. The failure to do so will likely result in the dismissal of the ERISA claim. Gayle v. United Parcel Service, Inc., 2005 WL 545553 (4th Cir. 2005). The importance of this appeal must not be underestimated, as it will form much of the “administrative record” upon which the court will base its determination if litigation is necessary, and it is critical that every medical record and document favorable to the employee’s cause be included in the appeal. With the administrative appeal hurdle cleared, the next question is against whom the claim must be brought. While it is clear under ERISA that your client — as a plan participant or beneficiary — has the right to bring a claim for benefits, it is sometimes less clear which entities are appropriate defendants. See 29 U.S.C. § 1132(a)(1)(B). The summary plan description generally states this information. As a general rule, the most important parties will be the ones who last processed (and denied) the claim and those that would be required to pay a successful claim. Recent cases also suggest that the plan itself should be named as a party defendant, along with the plan administrator and/or insurer. See Phelps v. C.T. Enterprises, Inc., 394 F.3d 213 (4th Cir. 2005). The plan sponsor (usually the employer) may not be a necessary party defendant in a welfare benefit plan claim if it has not taken part in the decision-making process, except where the plan sponsor or employer undertakes to act in a fiduciary capacity (and thus, plan sponsors are more frequently named as defendants in pension benefit plan litigation). The most common claims brought under ERISA involve benefit claims or claims of breach of fiduciary duties. As stated above, 29 U.S.C. § 1132 sets forth the types of claims that may be brought by participants and beneficiaries. Among these are actions for an administrator’s failure to supply requested information or to recover benefits due under the terms of the plan. 29 U.S.C. § 1332(a). Liability for breach of fiduciary is covered under 29 U.S.C. § 1109. Successful ERISA plaintiffs may recover the benefits improperly denied, along with pre-judgment interest and post-judgment interest. Quesinberry v. Life Ins. Co. of North America, 987 F.2d 1017, 1028-30 (4th Cir. 1993) While punitive damages and damages for mental anguish are not available under ERISA, attorney’s fees and costs may be awarded to either party. 29 U.S.C. § 1332(g). Lawyers sometimes bring claims relating to employee benefits covered by ERISA in state court. Although state courts have concurrent jurisdiction with the federal courts to hear claims for benefits under 1132(a)(1)(b), ERISA gives exclusive jurisdiction to the federal courts over all other types of ERISA claims. As a matter of practice, nearly every ERISA case not brought originally in federal court will be removed there. See 29 U.S.C. § 1132(e)(1) and 1132(f). And, of course, because of the preemption provision of ERISA discussed above, many otherwise viable state causes of action (e.g., fraud, breach of contract, badfaith, etc.) will in most cases there be dismissed. But see Holroyd v. Requa, 361 S.C. 43, 603 S.E.2d 417 (S.C. Ct. App. 2004) (professional negligence and fraud claims against agent selling alleged group insurance policy to employers not preempted). court. Essentially, the court reviews the denial of benefits to determine whether the denial was proper and should be sustained or improper and the benefits paid. The standard of review used by the court is one of the most important issues in an ERISA case, and the outcome of the case may hinge on which standard is used. There are essentially two standards of judicial review in ERISA matters. 228 (4th Cir. 1997). This is true even where the court itself would have reached a different conclusion. See Haley v. Paul Revere Life Insurance Co., 77 F.3d 84, 89 (4th Cir. 1996). Significantly, the evidence reviewed by the court will be limited to only that which was presented to the plan or administrator by the claimant, usually during the claims and administrative appeals process. Sheppard & Enoch Pratt Hosp., Inc. v. Travelers Ins. Co., 32 F.3d 120, 124-25 (4th Cir. 1993). As a result of the above, it comes as no surprise that many (if not most) benefit plans expressly reserve discretionary authority to the plan and/or its administrator. standard might slide back down to something more akin to de novo review. Although the issues presented by ERISA may seem complex, the main thing that attorneys (even [and maybe especially] those who never deal directly with employee benefits claims) must remember is that the statute is extremely broad. Thus, the practitioner must be able to recognize situations in which ERISA issues — and preemption — may arise.